Today, Dan went again to the Ministry of Interior in hopes of becoming a legal resident of Macedonia. 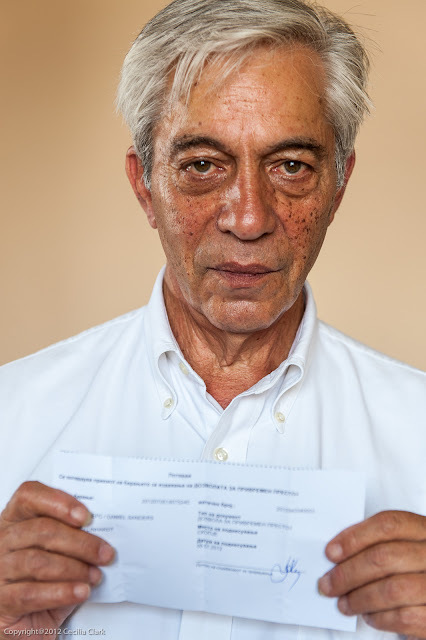 He submitted his paperwork to a woman who after looking through all the documents and mumbling something about being "late," directed him to the official photographer who took his photo. Dan was given a piece of paper with a number on it. A MOI employee told him that he would get is official residence card in about 15 days and that in the meantime, he should not leave the country. At this point, Dan's lawyer showed up at the Ministry of Interior office--Dan fired him and told him not to send him a bill for today. Now, it's my turn to travel this convoluted path to legal status. On Sunday, I turned 58. Since turning 58 a strange line I read last year in the Sacramento newspaper keeps going to my head: "58 year old woman struck by lightening as she was walking along the sidewalk." My birthday was very nice. Dan had to work until 3:00 pm that day, but in the morning Olivera came by with a cake and flowers and a gift to celebrate my birthday. In the evening, Dan and I took a taxi to a restaurant we had not yet tried. The taxi quickly left us; unfortunately, the restaurant was closed. We couldn't get another taxi back to the center because the Euro 2012 game final was about to begin. So, we walked back to the center and went to another restaurant. The game began just as we sat down. My birthday turned out to be a very big night for Spain and not so good for Italy. All those "instructions" were almost enough to keep me from going--especially the one about no cameras; however, we went and had a wonderful evening. Because of all the important dignitaries, there were security patrols walking the inside and outside perimeter of the embassy grounds. The event was attended by the President of Macedonia, the Prime Minister, other ministers, the head of the Orthodox Church, about 500 others, and us. First, we went through the reception line to shake hands with the US Ambassador, the Public Affairs Officer, and the Charge d'Affaires. Next, we enjoyed cold drinks, appetizers, and music in the shade cast by the US Embassy building. The building is on a hill above the River Varder and, luckily, that night there was a slight breeze. While the guests were arriving and mingling, a fireworks company was wetting down the foliage below the embassy. At 9:00 pm just as darkness was falling over Skopje, the fireworks began. They were extraordinary. Because they were being fired from below the embassy, the explosions of color rose right in front of our faces. Very exciting--but no photos. This is the first time in many years that we've been to a celebration of America's independence. On the 4th of July, a work day for Dan, I made hamburgers, a fine American meal, for dinner.